Hey Everyone, welcome back to Stash Blasting Wednesday. I’ve been trying to get ready for the Coldwater Studio Tour in June and so far I have managed to quilt a couple of pieces. I highlighted these pieces not too long ago in a post called Fast & Easy Designs With 5 Inch Squares. 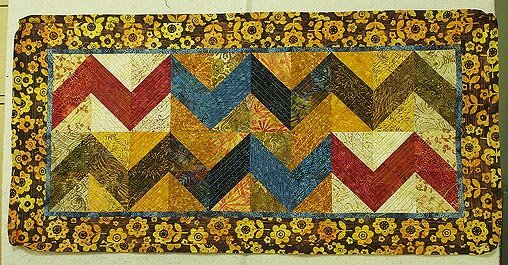 Today I am highlighting the zigzag runner that I used 40 – 5 inch assorted batik squares and made 40 half square triangles with them to create this zigzag pattern. I added a blue inner border which very easily could have been a binding.